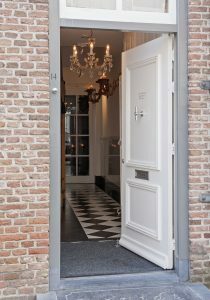 Our bed and breakfast offers two luxurious bedrooms in the heart of the medieval fortified town of Heusden in the south of the Netherlands. The B&B is situated in an authentic but quiet street in the town centre, which means all historical sights are within easy walking distance. The Governor’s House, the Townhall and several good restaurants are also near our B&B. Our house was built in 1619 and was recently (2016) completely renovated. It now offers stylish and trendy living, but at the same time it has kept its beautiful authentic details. Each bedroom has two comfortable beds with a private bathroom. The bathrooms have a rain shower, toilet and washbasin. Bathrobes can be borrowed for free. Our B&B offers free Wifi and there are coffee and tea making facilities at our guests’ disposal. In all arrangements a drink and a snack are included. For weddings we offer a magnificent arrangement! Contact us for an appointment to go through your wishes and we will do our utmost to make your wedding day unforgettable. And our B&B is located close to two of the best-known wedding venues. Super convenient, isn’t it? 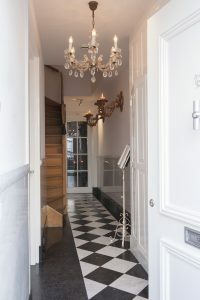 Price: € 125,- per room per night , including VAT and excl. tourist taxes. Price without breakfast is € 100,– a night. We are looking forward to hearing from you and meeting you at our B&B. 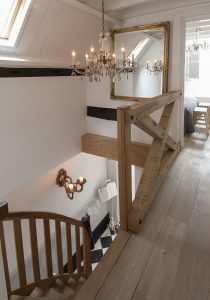 B&B Bed & Brood & Zo is situated in the heart of the medieval fortified city of Heusden. All interesting facilities are well within walking distance. Heusden has a beautiful and picturesque harbour, close to the centre of the city. The centre of Heusden is unique because of the many galleries, art and antique shops. It has medieval squares and alleys, which makes for enjoyable walking. The sights worth seeing most are the fortifications, the ‘Govenor’s garden’, the ‘Vismarkt’, the three standard mills, the city walls, the visitors’ centre and the Catharijne Church. And after an exciting day in the city there are numerous good restaurants and pubs to relax in and have a drink and a meal. And last but not least: on the first Saturday of each month (March to December) there is an antique fair. Come and enjoy the atmosphere! Buses to the city of ‘s-Hertogenbosch are a three-minute walk from our front door. Feel welcome, feel at home!